A point is defined by its position. It has no length, width or thickness. A straight line joining two points is the shortest distance between them. Three or more points are said to be collinear, if there is a line which contains all of them. A line is defined by its length and has no breadth. It has length units. (metre, foot, centimetre kilometre, etc.). A line contains infinite points. Through a given point, there pass infinite lines. One and only one straight line passes through two distinct points. Three or more lines are said to be concurrent, if they pass, through one point and that point is called the point of concurrence. Two lines are said to be intersecting lines, if they have a common point. When two straight lines meet at a point, they are said to form an angle. Angles generally are measured in degrees. There are 180° in a straight line and a full circle constitutes 360°. 1. Two angles are said to be complementary, if their sum is 90°. Complement of x is (90° – x). In the adjoining figure, Ð AOC + Ð BOC = 90°. :-> AOC and Ð BOC are complementary to each other. 2. Two angles are said to be supplementary, if their sum is 180°. Supplement of x is (180° – x). :->AOC + Ð BOC = 180°. AOB < 90° AOB is an acute angle. 4. An angle which is greater than 90° is called obtuse angle. AOB is an obtuse angle. 5. 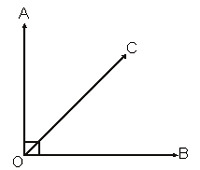 An angle which is exactly 90° is called Right Angle and the two lines are said to be Perpendicular to each other. AOB is a right angle and OA and OB are perpendicular to each other.